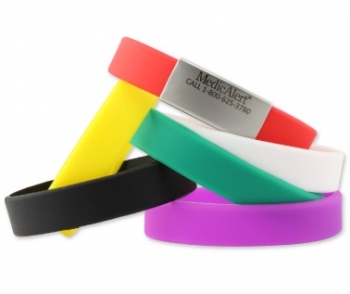 Product Review: Play Silicone Bracelet Bundle | Redefining "Good"
One of my work colleagues has a medical bracelet similar to the “Livestrong” wristbands. I really liked the idea, but my medical alert company did not carry them until recently. As soon as they had the option, I ordered a package with multiple bracelets (one by itself was $25, while with six bands it was only $30, so completely worth it). To put it simply, these are the best medical bracelets I’ve ever worn. No fiddly little clasps that are hard to open, break, or snag my sweater cuff. Comfortable fit that can stretch on and off, and I can change color based on what I’m wearing. No ruining a leather band when I wash my hands, either! My old nylon bracelet with the sport buckle was wearing out (especially since I play with my bracelet during meetings- I’m a fidgeter), and the long end of the band hanging out annoyed me (I trimmed it and melted the end so it wouldn’t unravel, but it still looked messy and sometimes got in the way). It is possible for the metal portion to be lost, but you’d have to work on it, and so far the plastic bands are holding up well. I can still wear one of my fancy beaded wristlets if I’m dressing up, but for something that is obviously a medical band but still has a low profile, it’s perfect for everyday wear.